Masked Aadhaar, in order to protect the sensitive, personal information of users. Under the 'Aadhaar Online Services' section, click on 'Download Aadhaar' link. In the Next page, select 'Masked Aadhaar' as your preference. Enter the required details viz. Enrolment ID/Aadhaar Number/VID, Full Name, Pin code and Security code, and click on 'Request OTP' button. Password Protection: You can access the document by entering the password, which is essentially the first four characters of your first name in capitals, followed by the four digits of your year of birth. Validity: A masked Aadhaar is completely valid as an identity proof for train, flight, hotel bookings etc. However, it cannot be used for availing government welfare schemes and subsidies. 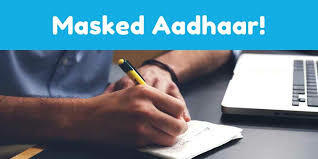 Masked Aadhaar provides an extra-layer of security to your Aadhaar card, and can be used as a valid proof of identity at various services, it is rendered invalid for availing government welfare-schemes and subsidies, which require details such as name, DOB, address etc.